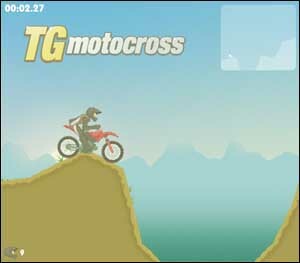 TG Motocross is the latest game released by David Thorburn available on his website Teagames.com. The object here is to complete a trial race divided in eight different stages as fast as possible. You control your trial rider with the arrow keys: up to accelerate and down to brake; right and left arrows to lean forward and backward respectively. Use down and right keys at the same time to lean forward while riding to climb steep; lean backward while riding for extra speed by using up and left keys at the same time. 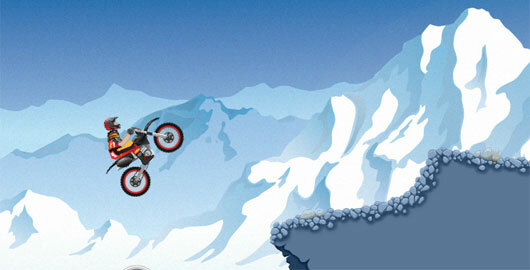 Designs and physics are amazing in TG Motocross and the game looks great. A training option is available: some stages are really hard to complete, and the rider is pretty tricky to control (especially in the last stages like Diablo Canyon). You will need a bit – if not a lot – of practice to get used to it. Another nice implementation is the map in the upper right window, showing your progress and the next obstacles. 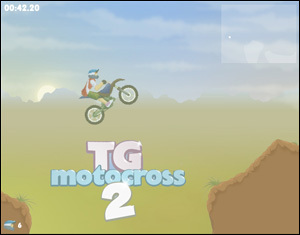 On the downside, there is no sound to add intensity to the game, and TG Motocross would have been probably more entertaining with a more powerful motorcycle. Having said that, just like several other games designed by David Thorburn, TG Motocross is a new challenging and addictive game. Have fun! TG Motocross 2 : better than the original! TG Motocross 2 is out! “The popular dirt bike time trial series continues with fresh new challenges”. Here is what David Thorburn wrote about his first famous TG Motocross sequel released today on his website teagames.com. Thorburn didn’t only design new levels: he revamped the graphics, and more important, make the game much easier to play than the original episode. The result is a motorbike that is much more fun and less tricky to ride, and I would definitely recommend this one to occasional gamers. You still control your trial rider with the arrow keys: up to accelerate and down to brake; right and left arrows to lean forward and backward respectively. Use down and right keys at the same time to lean forward while riding to climb steep; lean backward while riding for extra speed by using up and left keys at the same time. With 7 levels available and 4 more coming soon, TG Motocross 2 is better than the original in every way, and really deserves a try! 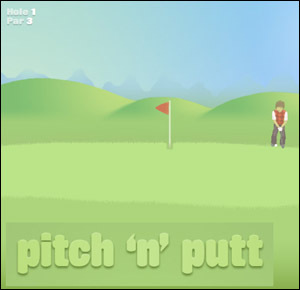 Pitch ‘n’ Putt is the latest game just released by the talented David Thorburn on his website, Teagames.com. The object here is to complete a challenging 9-Hole Par 35 golf course, as fast and as much under par as possible. Press the space bar to start your shot. Press the space bar again to set the power and press the space bar a last time to set the loft. It sounds easy to play, but like almost every golf game, it is pretty tricky to control: you’ll need some practice and it will probably useful to play the whole course once just to get used to. Don’t forget to use the arrow keys to check the fairway and locate the green, the bunkers and other obstacles that can affect your shots. As always, Pitch ‘n’ Putt features the same realistic physics and animation as other Thorburn games. My only complain is that there is no global view of the fairway (a map in the upper right corner of the screen, such as the one implemented in TG Motocross would have been definitely helpful), leading to some confusion during your first shots. Overall, Pitch ‘n’ Putt is a simple and elegant golf simulation designed by David Thorburn, perfect for a ten minute break!